Avoid branding your gifts. It can come off as an advertising ploy rather than a sincere gesture. Think outside of the gift box with commissioned art pieces or donations to local charities. Sometimes it's as simple as saying, "Cheers!" What better way to cap off the experience than to give your sellers something that will keep this milestone, and you, at the forefront of their mind. Consider giving your seller a set of personalized knives, wine glasses or other decorative items such as blankets and pillows. Many agents raved about Cutco knives that range from about $75 to $100 for a set of two. The second-most-popular gift is a set of wine glasses or bottles. Try personalizing the items with a monogram or a design that’s related to your hometown or state, such as the outline of the state with the word “home” in the middle. You have the option of using your logo, but as Mickie Shea points out, the gift can come off as an “advertising ploy” rather than a sincere gesture. 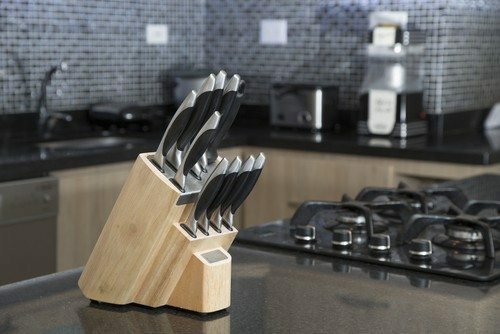 Give your seller a household item, such as a set of knives or wine glasses. Many agents seem to share her viewpoint, as they love to give customized wreaths and doormats or a set of “Just Moved” cards sellers can use to notify family and friends of their new address. If you want to take it a step further, Sabrina Osborn Reesor suggests even sponsoring a catered housewarming party. Give your sellers “Just Moved” cards to notify family and friends of their new address. Although your sellers were clearly ready to get rid of their home, it doesn’t mean they won’t miss the space where they lived and created great memories. To help them keep a piece of their former home, commission a painting or pencil sketch by a local artist. For those who don’t have the budget or the patience (art pieces can take up to 30 days to receive) for a commissioned piece, consider tapping into your inner Martha Stewart and make a photo album via ShutterFly. Many agents shell out a pretty penny for professional photos, and there’s no need to let them go to waste after the closing. Place the best photos into the album, and finish the book off with a special message from you. Give sellers a piece of their old home with a commissioned painting or sketch. Some agents are taking the adage “’tis better to give than to receive” to heart and opting to add a charitable element to the closing process. For each home sold, agents are making donations on their seller’s behalf. Gayle Zientek donates a bike to Toys for Tots after each closing, and gives the seller a gift basket that includes a picture of the child and his or her new bike. In addition to doing something great for your community, agents see it as a sincere way to build company identity and culture. Tis better to give than to receive! Donate to charity after each closing. Instead of giving a one-time gift, consider using a subscription service. James Haydon likes to use quarterly.co, which is a service that will send a gift box curated by celebrities such as Bill Nye, Timothy Ferriss and Pharrell Williams. The boxes range from $50 to $100, so if you’d like something a little more budget friendly, Kathleen Troulinos suggests gifting your seller a yearly subscription to their favorite magazines. Remind your seller of your service with a monthly subscription. Gift cards can go from tacky to thoughtful with careful planning. Have a champagne toast and give your seller a bottle to take home. No matter what you choose to give, what seems to be unanimous is that the gift should be personalized with the seller — not your bottom line — in mind. Your exceptional service and thoughtful giving will do the trick just fine. What would you add to the list? Share it in the comments below!